Just earlier this week, I was telling you guys about the impending doom of blood oranges going-out-of-season nightmare here but lo and behold, I checked the pot where I planted a dwarf morow blood orange tree and it's full of little flower buds that I'm hoping will bloom and give us some fruit next year! I'll be tending to those oranges like a protective hen watching over her chicks. Squirrels and bugs, stay away! 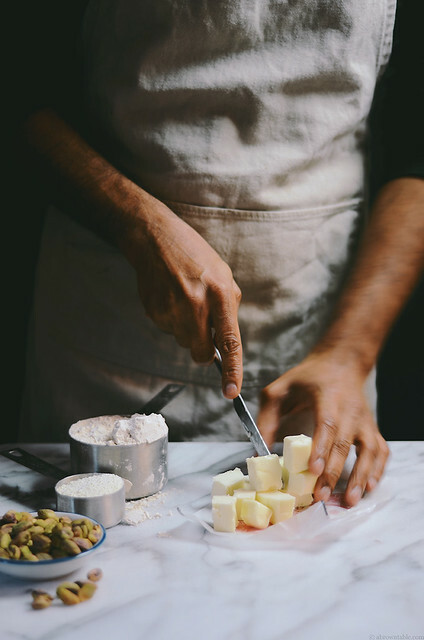 This week, I have a little interview with Common Table Co where I'm sharing my thoughts on food and photography. I keep meaning to share this super useful post by Michelle who has made a pretty comprehensive collection of pie baking tips that you should check out and bookmark. I like milk flavored things and in cookies with tea, it's a bonus. I did a few experiments when making these whole-wheat cookies. I started with milk, then tried condensed milk and even evaporated milk but the flavor and sweetness from the milk were just not right plus, the more liquid you add the batter keeps getting messed up. I finally tried some non-fat dry milk powder which did the trick. It brought the flavor and natural sweetness of the milk into the cookie. 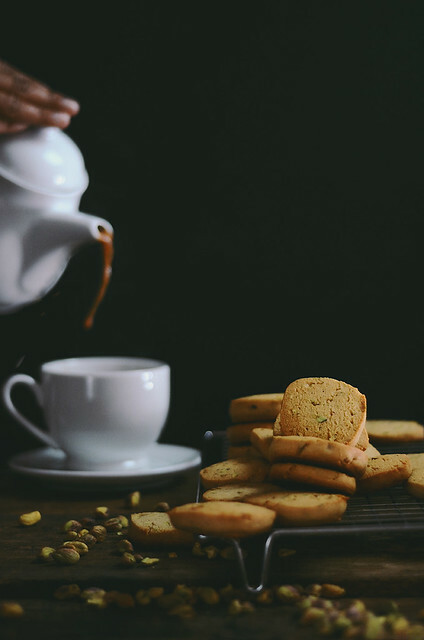 These cookies aren't too sweet or buttery but they've got that nutty flavor from the pistachios along with the hint of milk. They're good with tea and/or coffee or just for those moments when you want a little treat. 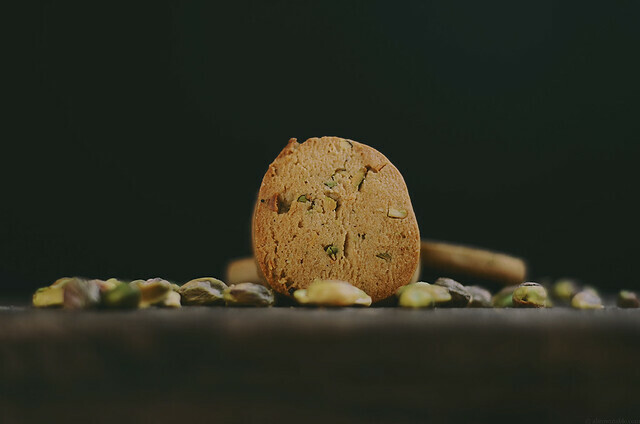 I strongly recommend adding pistachio extract but if it's hard to find use almond extract, the pistachio extract however really bumps the fragrance and flavor of the cookies. 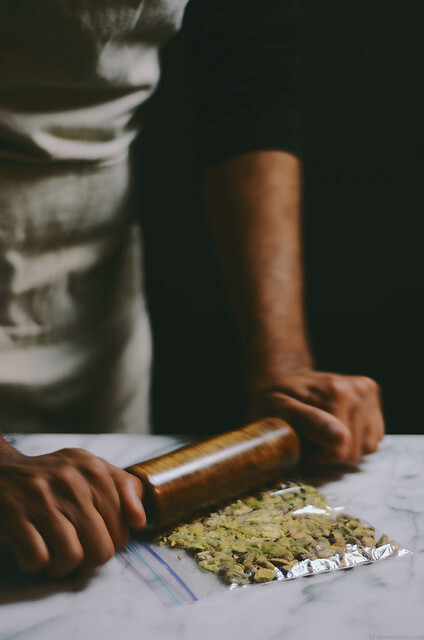 Crush pistachios using a rolling pin in a small ziplock bag, less mess and it's easy. You can fold the pistachios in the mixer by mixing the final dough at low speed but I prefer the hand method, it gives me better control over the dough. Chill the dough before you bake, it will make give you a more flavorful and crispier cookie. 1. Place the butter and sugar in the mixing bowl of a stand mixer. Using the paddle attachment cream the butter and sugar on medium-low speed for about 4-5 minutes. Stop the mixer and scrape the sides of the bowl using a silicone spatula. Then add the egg and continue to mix for another minute until combined. Add the pistachio/almond extract and mix for 10 seconds. 2. In a large mixing bowl dry whisk all the dry ingredients from the milk powder to the salt. Add half of this mixture to the wet ingredients in the mixing bowl and mix on medium-low speed until almost combined. Then add the rest of the dry mix and mix until combined. 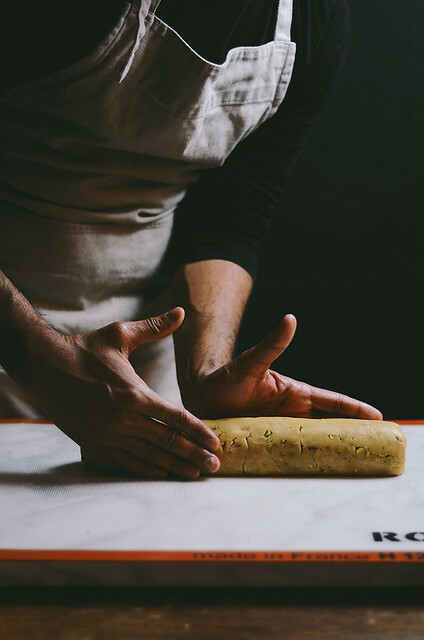 Remove the dough and transfer the dough onto a cool surface such as a marble pastry board or a non-stick silicone pastry work surface or parchment paper. 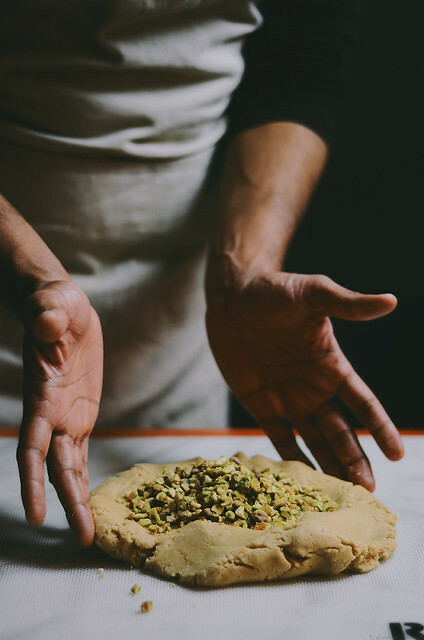 Flatten the dough with your hands and place the pistachios in the center. 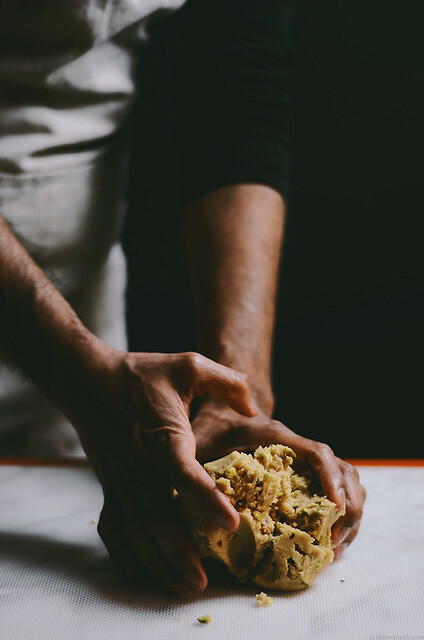 Fold the dough gently to combine the pistachios. 3. Take a clean sheet of 12" X 16" parchment paper. 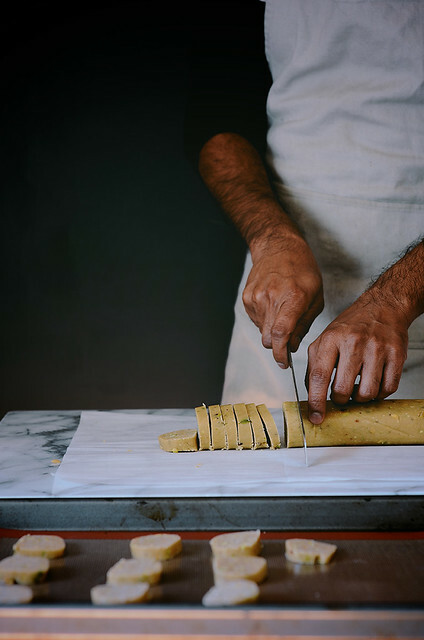 Shape the dough into a log that is around 12" in length. 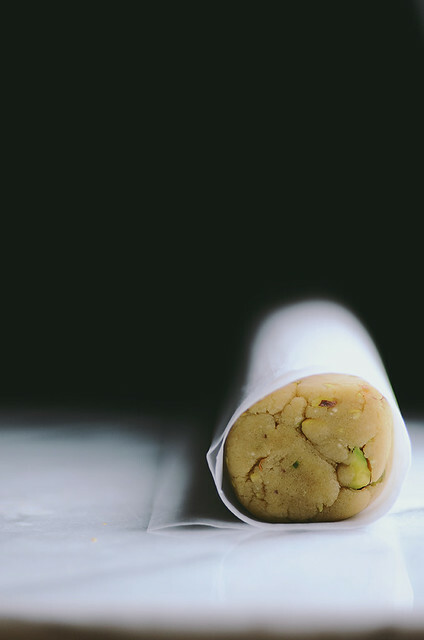 Wrap the roll with the parchment paper starting from one end by rolling the paper over the dough. 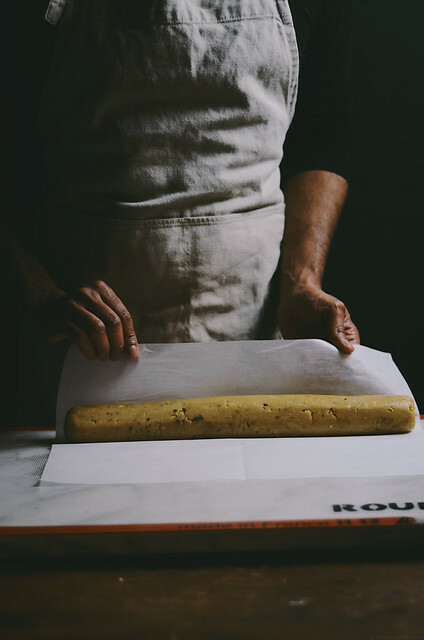 Wrap the roll with clingfilm, place it on a baking sheet and refrigerate for at least 4 hours to overnight. 4. To bake, place a wire rack in the middle of the oven. Preheat to 350F. Remove the cookie dough roll from the refrigerator and using a sharp serrated bread knife cut the dough into 1 cm thick individual cookies. Place the cookies on a baking sheet lined with parchment paper or a baking silicone mat, about 1 inch apart from each other. Bake one set of cookies at a time in the preheated oven for 10-12 minutes until the edges just start to turn golden brown. Remove from the oven and carefully transfer the cookies to a wire rack to cool completely before storing in an airtight container.